These words from Paul Simon’s song “The Dangling Conversation” kept running through my mind as I attended Amy’s View at Park Square Theatre. Yes, the play is talky. 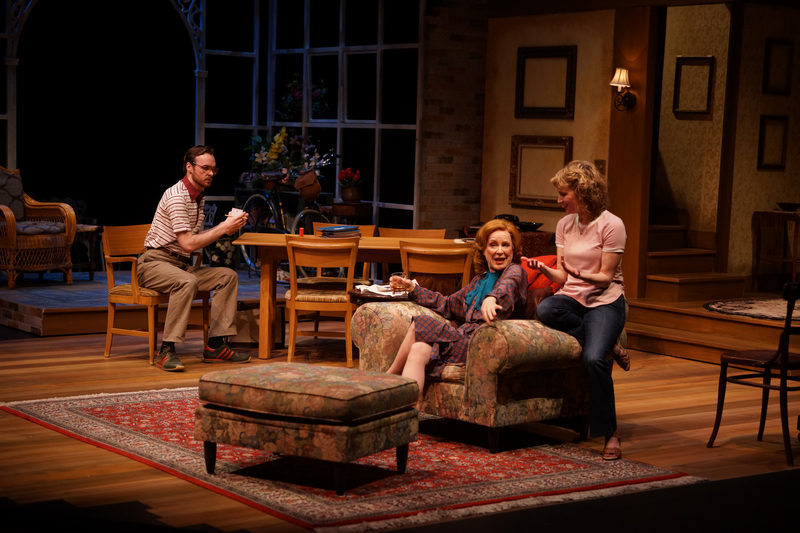 Yes, the play actually asks if the theatre is “dead.” Yes, the play, like Simon’s song, is at times pretentious, but it is also multi-layered and provides insights that linger with its audience. 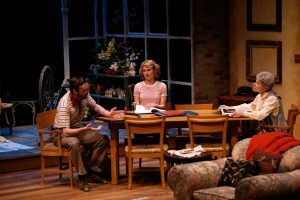 Director Gary Gisselman successfully stages British playwright David Hare’s wordy but engrossing play with an outstanding cast, telling a story spanning 16 years. The eponymous Amy is far too self-sacrificing and subscribes to the naive “view” that love conquers all. We first meet her in 1979, when Esme Allen (Linda Kelsey) – a famous British stage actor – is visited by her adult daughter Amy (Tracey Maloney). Amy works in publishing and brings her boyfriend Dominic (Gabriel Murphy) to meet her mother. Dominic is one of those analysts, publishing film critiques and interviews of those who work in media. Amy, it tuns out, is pregnant, which is problematic because Dominic is a narcissistic jerk who places success in his media world above all else, including Amy’s love. Esme and Dominic engage in repeated and harsh debates on the cultural value of popular media versus traditional theatre, leading Esme to take a strong dislike to him. As Amy’s rocky relationship with Dominic progresses through the years, Esme is dismayed by the fact Amy’s devotion to a man who emotionally neglects her. Esme, on the other hand, becomes involved with her neighbor Frank Oddie (Nathaniel Fuller) who is also her financial advisor…which makes things awkward when Esme is financially ruined. Amy, naturally, is outraged by the lack of legal action from these financial woes. As Esme, Kelsey dominates the production and appears in virtually every scene. She succeeds in portraying a domineering, yet caring mother who is unable to suppress her disdain of Dominic to ease the strain on her daughter. Maloney plays an earnest, appealing Amy who becomes more and more desperate as the play progresses. Murphy changes from a socially awkward young man to a self-absorbed and successful media producer. In the final scene, he maintains his successful aura and yet makes clear that he knows he is lacking something as a human being. Cathleen Fuller (as Esme’s mother-in-law) and James Rodriguez (as the co-star in Esme’s play at a low-prestige theatre in London) both provide needed comic relief to an otherwise very serious play. Nathaniel Fuller as Oddie valiantly plays a likeable character whose conscience is woefully underdeveloped. This play has a number of interesting themes underlying the narrative. Which theme is the most prevalent depends upon your perspective. One theme is Amy’s belief that if everyone would just love each other, everything will work out (spoiler: It does not). Another theme is the competition between the value of artistic integrity versus the allure of popular celebrity. There are also underlying class themes with Esme being part of the theatre aristocracy versus Dominic, a poor orphan who grew up to be a bitter young man who distains established theatre. The crux of this play is how abusive relationships can result in the estrangement of loved ones who observe the abuse from outside. Esme recognizes early on that Dominic will never put her daughter’s happiness above his egotistical needs. Amy, however, refuses to admit this and resents her mother’s insight on the matter. Similarly, Amy sees how Oddie has taken financial advantage of her mother; Esme’s refusal to face reality further estranges her from her daughter and seals her economic ruin. This play may not be everyone’s cup of tea. Although wordy, the play delivers action and a good story that add up to a gripping drama. Many will find meaning in dialog that examines the relationships and themes in the lives of the three main characters in Amy’s View. The odyssey of their lives may be unexpectedly tragic, but it inspires thoughtful reflection to ponder long after leaving the theatre.